El Rancho de Buenos Espiritus was designed and built by the artist, Fremont Ellis in 1932 for Ms. Lawry of Kansas. The area of San Sebastian became an artist colony in the 20s, 30s and 40s. The stunning renovation of the double adobe house includes an indoor pool and spai. Four bedrooms, six baths, a huge living room and covered portals for dining with an outdoor grill and fireplace sitting area. The house sits on 17 acres with trails for contemplative walks. 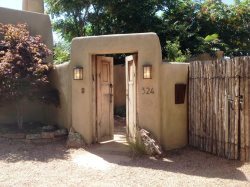 The area is 15 minutes from the Santa Fe Plaza area and has beautiful views of the mountains as well as a pinon forest. Fremont Ellis was one of the artists who began the art colony in Santa Fe. Georgia O'Keeffe stayed in the guest house of El Rancho de Buenos Espiritus when painting with him. The house has beautiful details including doors made by Ernest Knee, the artist and photographer. It is replete with 1o fireplaces and furnished with many Native American and Spanish Colonial Antiques. The combination of spacious entertaining room, beautiful architectural areas, indoor pool and spa, 17 acres of paths and wonderful views makes this a perfect family home.